The Shiromani Akali Dal (SAD) today said the Congress government had run away from discussing emergent people issues including the farm crisis and denial of social welfare benefits to Dalits and poor because it had nothing to show by way of performance.In a statement here, former ministers Parminder Singh Dhindsa and Bikram Singh Majithia said the SAD- BJP legislature group had submitted two adjournment motions on the failure of the government to even start implementation of the Rs 90,000 crore farm loan waiver due to which 300 farmers had committed suicide as well as denial of social welfare benefits to the weaker sections. The government even did not allow a debate of its failure to bring parity of sugarcane assured price with Haryana due to which sugar barons associated with it are benefitting. Similarly the plight of potato farmers was also ignored and no support was announced for them. "We maintained that there was nothing more important that these two issues but both adjournment motions were rejected on flimsy grounds". The former ministers said today the SAD-BJP legislature group had tried to bring the problems being faced by Dalits and poor sections of society due to denial of pension benefits to them to the attention of the State government but the treasury benches turned a deaf ear to this appeal. "As many as twenty lakh people are not getting their pension dues worth Rs 1,000 crore. Besides old age pensioners these also include widows and the handicapped and orphans. Students are being denied scholarship money. Even brides of SC and weaker sections are not being given shagun benefits since one year what to talk of enhancing these benefits to Rs 51,000. 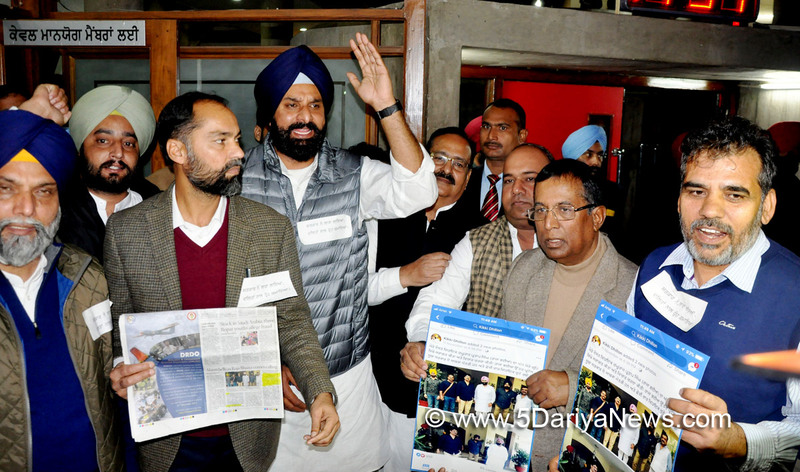 The Social Welfare minister today had no answer when confronted with these revelations and admitted no payments had been made by trying to deflect the issue by stating a bill had been raised to disburse shagun".Asserting that all this reflected the anti farmer and anti Dalit face of the Congress government, Mr Dhindsa and Mr Majithia said the Congress party hid behind excuses like lack of time. "This despite the fact that the assembly was adjourned two hours ahead of schedule yesterday". The leaders said even today the Speaker did not give any time to speak on how lakhs of pensioners and parents of poor brides were making ends meet without disbursal of their due benefits to them. However the Speaker had one hour time to discuss the liquor policy. If this is not the height of insensitivity what is?" the leaders asked. The Akali leaders said by refusing to debate any people issue the Congress government had thoroughly exposed itself. "It has also achieved the dubious distinction of being the first government in the State's history to fail to deliver on even one of its poll promises. It has no face to show to the people and that is why it truncated the session to just two sittings and did not allow any debate", the Akali leaders added.